If I have an addiction outside of tailoring, it is not shoes or ties but outerwear. Leather jackets, suede blousons, trench coats: I love the ability of such big pieces to radically change a look and a silhouette. Leather, cotton and their derivatives have just as much appeal as wool. Of course, the problem with such casual pieces is that they look so much better when they are aged. And if you have a lot of them, they don’t age quickly. Which leads one onto vintage outerwear. 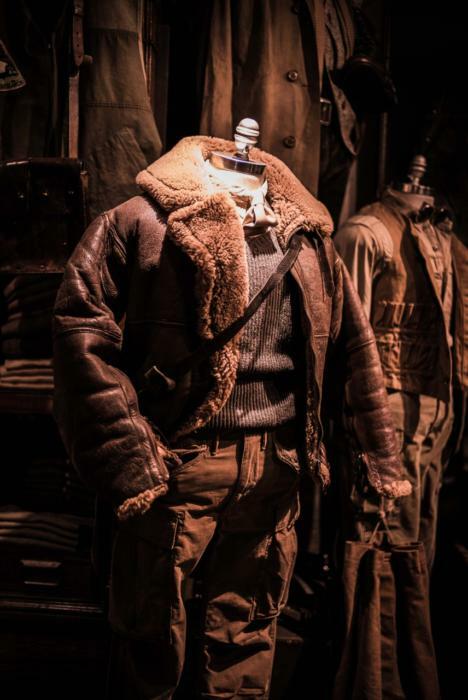 One of the interesting things about RRL – the brand set up in 1993 by Ralph Lauren and initially inspired by the ranch he runs with his wife Ricky (hence RRL) – is that it sells real vintage clothing alongside vintage-inspired designs. Most stores only use vintage as decoration. It is implied that the new clothing retains the value of the old, though that is rarely the case. RRL, by contrast, is happy for the two types of clothing to compete. I interviewed the RRL designers in New York as part of a piece on The Rake website recently, and it was interesting to note how deliberate the choice was to share retail space between the old and the new. It demonstrates a lot of the design and construction features that have been borrowed from old pieces, and shows a genuine love of vintage clothing. The problem with such vintage clothing, however, is the fit. Practical outerwear is often roomy, both to accommodate equipment and a multitude of shapes. Genuine workwear was usually cut square, both because it was easier and because fit was of little concern. Finally, some pieces were made for very specific purposes that make them impractical today. 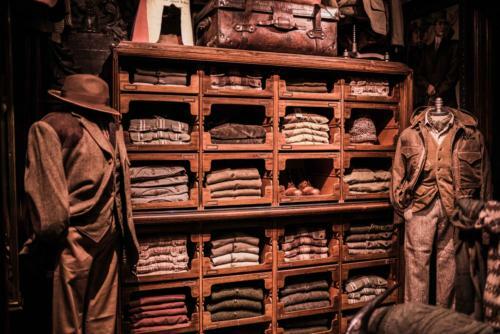 The vintage pieces at the RRL store in London – which is worth a visit in any case – bring this home particularly strongly. The WW2 flight jacket shown at top, for example, is a beautiful piece of engineering. Made of thick shearling, it is incredibly warm and insulating. But it is also cut with inserts under the arms so that they sit at right angles to the body. When you wear it you can barely hold your arms at your sides; you certainly can’t pop up the collar. It was not made with such piffling concerns in mind. It was made for a man to sit in a cockpit for hours an end, and survive the wind and the cold. It is not an urban entity. The two waxed jackets below demonstrate the opposite problem. The one on the left is a Barbour fishing jacket. It is beautifully aged and has nice touches of wear without sacrificing practicality – as with all the RRL pieces. But it is also aggressively A-line. It is pinched at the back here, as several vintage pieces are, to suggest more shape. In reality you could fit two small children under it alongside you. The wax jacket on the right is RRL’s recreation. It is a lovely piece, with great detailing on the pockets and sensitively if artificially aged. But it doesn’t have the charm of the vintage Barbour. So what’s the solution? Find new pieces from brands such as Ralph Lauren and wear them intensively. Wearing them in the rain always helps, as does keeping them crumpled up in a bag. (No need to run them over with a tractor, as some Barbour owners are renowned to do.) Or, if intensive wear is not an option then find good, hand-applied distressing. Just don’t buy distressed jeans – it doesn’t take long to imprint your own patina on a pair of jeans and they look so much better for it. You can follow the discussion on RRL: Vintage outerwear and modern fit by entering your email address in the box below. You will then receive an email every time a new comment is added. These will also contain a link to a page where you can stop the alerts, and remove all of your related data from the site. 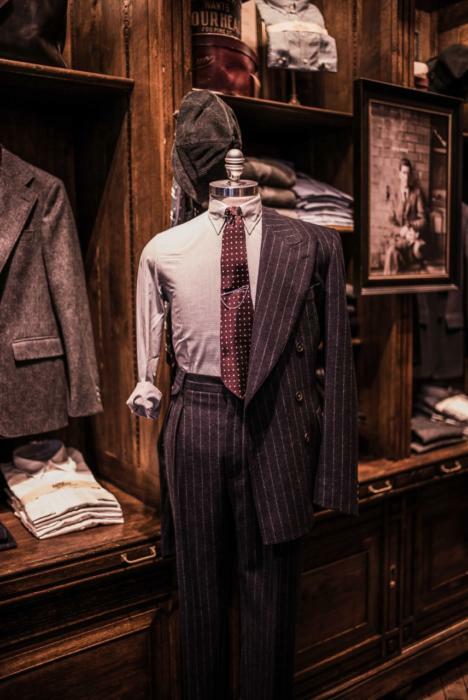 Speaking of the big companies and their ability to have superior designs and wool patterns quite often what is to stop one (if I was extremely wealthy) from buying something from a shop and requesting a tailor to copy it with bespoke touches? With someone the size of Ralph Lauren, the cloths are all exclusive to them, so you couldn’t get exactly the same fabric. But otherwise, nothing. In fact, better to not buy the piece but take photos, notes or even buy it and then return it. 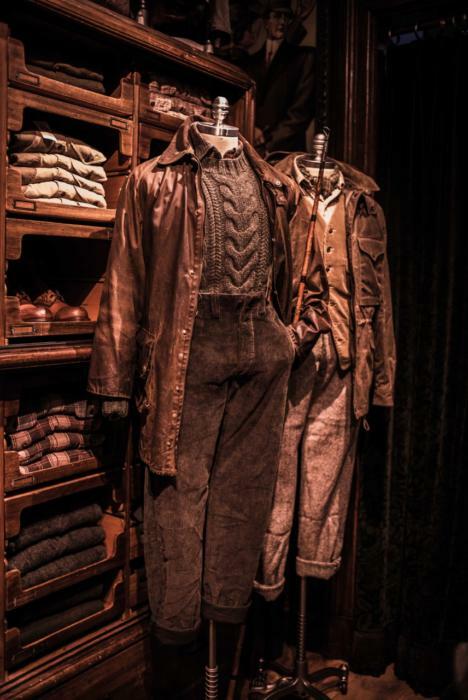 Bear in mind most tailors aren’t set up to make many of the things involved in casual wear though, such as working with leather, waterproof cloths or particular hardware. Why could one not go to the mills that people like RL have their clothes made and ask for some? or are there exclusive agreements? Is there a future in a company who can source these harder to find fabrics? Or introduction of more haute couture tailors who are able or willing to spend a hell of a lot more on finding unique fashionable fabrics? There are exclusivity agreements. Many of the big brands develop their cloths in that way, and no mill is ever going to risk a big customer like that by supplying the cloth to anyone else. Mills’ normal offerings are nearly always conservative and middle-of-the-road too, because it is very expensive to develop a bunch and they are dealing with lots of small customers. A big brand, on the other hand, has the power to sell luminous-green tweed in volume, around the world, and can therefore justify designing and weaving it. That’s why the cloths in Ralph Lauren are often more interesting or at least unusual than what the bespoke tailor can offer. When you say it is aggressively A-line do you mean because of being clipped to the manikin (as alot of rtw is portrayed in advert), or that it was originally designed that way with a skirt cut. thanks. Designed that way. I’m not a fisherman, but I guess you might have a lot of equipment at the waist, or want it to go down over a stool when seated? In response to Anonymous (above), we’ve written about those mills a fair bit. Search for our coverage of Pennine (weaver), Johnsons (finisher) and Dugdale (merchant). Also Vitale Barberis. Do you know of any high quality tailors outside of London in the UK? Could you ask aorund about them? Whilst your posts are good they really are only concerned with those in London, and we arent all southerners! Sorry, you’re right I am a bit London-centric. I haven’t used any tailors outside London, but the mill reps are the best source for this kind of thing. I’ll ask a few and put together a list. As I’m based in Edinburgh Peter Johnston could well be the answer! One option for people that buy Barbour or leather jackets and want to antique them quickly is using them in house, sometimes I take naps wearing my new Barbour International, it works. I see that you have written ‘most mills’, and therefore you aren’t saying that big brands best all the mills out there. What about Dormeuil or Holland and Sherry? I have seen some pretty daring stuff from the former. You’re right, Dormeuil and Scabal both do pretty exotic things. They are more innovative than the rest, though it’s still true that they are in pretty small volumes. They also tend to be of a certain type – Jade woven through a pinstripe, for example, which I know some people like but I’d imagine isn’t to the taste of most readers. Brian Smith (ex A&S) who is based at Fox Flannel is also well regarded. He made me a lovely pair of flannel trousers last year and I hope to get him to make me trousers and waistcoat in a dark ble flannel to wear with a pair of dark brown ‘pebble grain’ oxford shoes that I am having made by Jason Amesbury. Coincidentally, a reader just left a comment on the ‘Green is the third colour’ post about Brian. He made me a green flannel suit two years ago. I was told he had since retired though? I think Brian Smith is still operating from Fox Flannel. I spoke to him about 6 weeks ago. Interesting to read your comments on his work. I am based in West Wales and rarely get up to London. When I do I tend to favour John Pearse where the atmosphere is more to my liking than Saville Row. As a ‘poor provincial’ I find Brian Smith’s prices a little easier to digest, however. Yes, just checked and you’re right. Brian hasn’t retired – not sure who I was getting mixed up with. Thanks for the correction. A great article! There’s a lot of good stuff described and pictured here. Outerwear is probably my “addiction” – why is it so neglected by British men? But please don’t use the expression “outside of” as you do in your first sentence. The “of” is redundant and therefore incorrect: the sentencer would have better read ” an addiction outside tailoring”.